On average, a 5-ton mini digger will cost between £60 and £95 for a day, and £350 to £400 for a week. This is the base rate, however, and you’ll need to factor in additional costs like travel and operator fees. As such, you’ve got to be savvy if you want to keep costs as low as possible. Unsurprisingly, the further away you are from the supplier, the more you’ll have to pay for the digger to be delivered. It is essential, therefore, to do your homework and choose a hire company as close as possible. If you use a site like Quotatis, you will be able to find local contractors who will be able to help. Depending on the company, delivery fees will either be calculated by the round-trip mileage or from a pre-determined banding system. If your preferred supplier uses the latter, they will normally have a map on their website which clearly shows the banding for estimated delivery costs. Most firms will calculate expenses for every 10 miles, and up to a distance of 40 miles. On average, it’ll cost you £30 if you live within 10 miles, with prices rising to £60. It can be tempting to hire the biggest digger you’ll need, but this is a false economy. It’s far better to hire a slightly smaller machine because the hire rates are likely to be less. For example, rather than a 5-ton digger, you could opt for a 1.5-ton JCB. These are ideal for small DIY residential projects such as landscaping, excavating a pond or removing soil for foundations. Though most firms will advertise a fixed day rate, there will normally be discounts available. For example, digger hire prices might be set at £60 per day. However, if you rent the equipment for two days it could cost £105, £145 for three days and so on. If you’re unsure how long a project will take, opt to pay for an extra day. This is far better than having to send the digger back and rent it again, effectively doubling the delivery fees. Okay, so the idea of driving a digger around your garden might sound like a lot of fun, but these pieces of equipment are actually a lot harder to operate than they look. It can take quite a lot of practice to use them efficiently, and you might find half your day is wasted simply trying to operate the machine properly. As a result, it’s sometimes wise to pay for an operator too. Hiring a contractor will normally cost around £200. It might seem a waste of money to pay for an operator as well as the digger, but it can actually save you money. Skilled drivers will get the job done far quicker so you don’t have to pay as much in hire costs. In addition, most contractors will offer some friendly advice on other project aspects too, like drainage problems or soil disposal, for example. One of the most unexpected mini digger hire costs is the deposit. This can be pretty hefty, and you shouldn’t be surprised if a firm wants to charge a refundable fee of £750 before you’re allowed to take delivery of the equipment. This unforeseen expense is because of the valuable nature of the tools you’re hiring. In most cases, the deposit will be a refundable debit or card transaction, and after you’ve returned the digger, the money will be refunded, minus the hire costs. For example, if you’re charged £750 and you hired a digger for two days at £60 with an additional £30 delivery fee, you’ll have £600 refunded into your account. One of the easiest and obvious ways to reduce the cost of mini digger hire is to do without the equipment altogether. 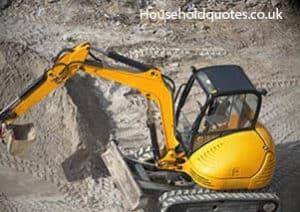 These are big pieces of machinery which come with a costly hire fee, so if you can get the work done yourself with a shovel, you can save a lot of money. Of course, there will always be projects when you can’t even consider manually excavating the soil yourself. However, if you’re making a small pond or building some garden landscaping, doing the manual work yourself can save hundreds of pounds. No mention about insurance on digger hire. I am trying to hire a digger for a bungalow we just built our 3rd self build project so we hired diggers before including the foundations of this one. We now find that the self hire diggers companies want the customer to insure while using but on enquiry of this I find that my husband needs a tradesmen insurance policy for them to add the insurance on to. My husband is a professional builder but is not self employed he has been employed for many years as a construction site manager so does not have a tradesman policy. It now looks as though it is not possible to hire a digger this way.